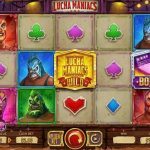 Lucha Maniacs is a video slot game from Yggdrasil that is inspired by Mexican wrestling. Even though the wrestlers look angry they will do everything that is in their power to match the same symbols and bring some huge wins your way. Lucha Maniacs is packed with special features. First we have the free spins round which is activated by landing 3, 4 or 5 of the wrestling ring scatters for which you will receive 7, 15 or 30 free spins and 3 features. 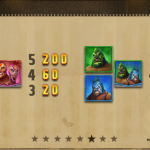 There are 7 features in total and before each round you will have to pick 3 cards to see which ones will be active during your round. They are as follows: 2 extra wilds with every spin, 2 or 4 extra free spins, a sticky wild in the center reels, 2 wrestlers merged for bigger wins, one wrestler acts as a wild, one wrestler appears stacked, one wrestler comes with a x3 multiplier. If you happen to use the Golden Bet you will have one extra feature during the free spins round. Then we have the Poster Bonus which is activated with only 2 scatter symbols where you have to pick from 4 posters where you can get a cash prize or 7 free spins with 3 features. 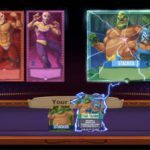 Lucha Maniacs is one heck of a game that we love to play. This title comes from Yggdrasil and it is one of their best games, at least for us. We loved the fact that there are plenty of features where you can win huge. And another important thing is that you do not play the free spins round only, but it seems that every time you play a different game thanks to the special features that are added to the round. For another great engaging slot you should consider playing Legend Of The White Snake Lady a 5 reel slot by Yggdrasil.